"Do not do unto the environment of others what you do not want done to your own environment... My hope is that this charter will be a kind of Ten Commandments, a 'Sermon on the Mount', that provides a guide for human behavior toward the environment in the next century." This "Ark of Hope" will be presented to the United Nations along with its contents in June of 2002. It is hoped that the United Nations will endorse the Earth Charter document on this occasion; the tenth anniversary of the UNCED Earth Summit in Rio. Placed within the Ark, along with the Earth Charter, were various items called "Temenos Books" and "Temenos Earth Masks." Temenos is a concept adopted by Carl Jung to denote a magic circle, a sacred space where special rules and energies apply. Some of the Temenos Books were created within this magic circle by children, who filled them with visual affirmations for Mother Earth. Fashioned with the "earth elements", the Temenos Earth Masks were also worn and created by children. In 1992 Maurice Strong was the Secretary General of the historic United Nations (UNCED) Earth conference in Rio. This gathering featured an international cast of powerful figures in the environmental movement, government, business, and entertainment. Maurice Strong's wife Hannah, was involved in the NGO alternative meeting at the Summit called Global Forum '92. The Dalai Lama opened the meeting and, according to author Gary Kah, to ensure the success of the forum, Hanne Strong held a three-week vigil with Wisdomkeepers, a group of "global transformationalists." Through round-the-clock sacred fire, drumbeat, and meditation, the group helped hold the "energy pattern" for the duration of the summit. It was hoped that an Earth Charter would be the result of this event. This was not the case, however an international agreement was adopted – Agenda 21 – which layed down the international "sustainable development" necessary to form a future Earth Charter agreement. "It is the responsibility of each human being today to choose between the force of darkness and the force of light." "We must therefore transform our attitudes and adopt a renewed respect for the SUPERIOR LAWS OF DIVINE NATURE," Strong finished with unanimous applause from the crowd. Despite the disappointing setback of no official agreement toward a "peoples Earth Charter", Maurice Strong forged ahead, with Rockefeller backing, to form his Earth Council Organization for the express purpose of helping governments implement UNCED's sustainable development which Agenda 21 had outlined. Agenda 21 was perhaps the biggest step taken to facilitate any future "enforcement" of a patently pagan Earth Charter. "the Charter will stand on it's own. It will be in effect, to use an Anglo-Saxon term, the Magna Carta of the people around the Earth. But, it will also, we hope, lead to action by the governments through the United Nations." "A post-christian belief system is taking over – one that sees the earth as a living being mythologically, as Gaia, Earth Mother – with mankind as her consciousness... Such worship of the universe is properly called cosmolatry." The "For Love of Earth" day-long celebrations at Shelburne Farms Vermont began with an early morning pilgrimage during which 2000 or so participants, led by Satish Kumar, walked to the "great barn" where they were greeted by the sounds of the "Sun Song" played by musician Paul Winter. The Pagan festivities continued with the words of Dr. Jane Goodall, Satish Kumar and organizer Dr. Steven C. Rockefeller. The Earth worshippers were treated to dance, music and paintings of several Vermont artists, after which they joined hands and offered an "Earth prayer" of "reverence" and "commitment" to Mother Earth and the "Ark of Hope". Satish Kumar, who led the early morning pilgrimage at Shelburne Farms, is an an influential advocate of Gaia. Kumar says that "contemporary thinkers of the green movement are collectively developing an ecological world-view." The Earth Charter is the green movement's crowning achievement toward this holistic world-view, and the practical means by which all of us will soon be held accountable to "Divine Nature". "Gaia is the New Age term for Mother Earth. The New Age believers hold that the earth is a sentient super-being, kind of goddess, deserving of worship and, some say, human sacrifice. Compared to Gaia worship, the simple animism of primitive cultures is wholesome." Musician Paul Winter also has deep roots within the green movement and "creation spirituality." He has performed concerts at the Cathedral St. John the Divine in New York City, on the solstice and equinox, for well over twenty years. These pagan festivals, in a supposedly christian church nonetheless, are generously sponsored by the Rockefeller Foundation and a new age organization called the Lindisfarne Institute – the latter of which has its headquarters in the Cathedral. Maurice Strong is also a member of Lindisfarne (publishers of G-A-I-A, a way of knowing) along with Gaia theory biologist James Lovelock, and admitted Luciferian David Spangler, among others. Paul Winters' most recent concert at St. John the Divine was for the annual Earth Mass, on 7 October.3 The fact that this annual October 7th Earth Mass coincides with the hindu Holy Day of Dassehra (worship of the Great Divine Mother) cannot be a coincidence. Winter and band-mates play a tune called Missa Gaia as part of the Feast of St. Francis. The Pope once attended the Feast of St. Francis at St. John the Divine in 1986. Stressing the unity of all the world's religions, John Paul II happily shared the platform with a Tibetan Lama, a Hindu swami, a Native American medicine man, and a Moari high priest. "has long been a center of New Age and radical-left 'enlightenment' and high-brow Establishment 'culture'." "a female Christ on the cross, complete with shapely hips and full breasts." The Earth Charter Initiative was launched in 1994 by Maurice Strong, his newly formed Earth Council and Mikhail Gorbachev, acting in his capacity as president of Green Cross International. In 1997, the Earth Council and Green Cross International formed an Earth Charter Commission to give oversight to the process. A final version of the Earth Charter was issued by the Earth Charter Commission in March 2000. "was drafted in coordination with a hard law treaty that is designed to provide an integrated legal framework for all environment development law and policy." This hard law treaty is called the International Covenant on Environment and Development and is being prepared by the Commission on Environmental Law at the International Union for the Conservation of Nature (IUCN), a behemoth agency which oversees 700+ governmental agencies worldwide. The Earth Charter, consisting of 16 principles, has its roots in the values of the Transformational Movement. Jan Roberts, president of the Institute for Ethics and Meaning describes this Transformational Movement as a paradigm shift from individualism, self-interest and separativeness, to unity, wholeness and community. Steven C. Rockefeller was the prime candidate for the leadership role as co-chair of the Earth Charter Steering Committee, the Drafting Committee and co-chair of the final Earth Charter Commission. Besides being a professor of Religion and Ethics at Middlebury College, expounding the virtues of "creation-centered theology," in his capacity as trustee of the Rockefeller Brothers Fund, his family's resources ensured the success of the project. It's clear that the global transformationalists are promoting the Earth Charter as the "new scripture." At the presentation of the Ark, and its "new gospel" contents, we can expect that it will be endorsed by the U.N. 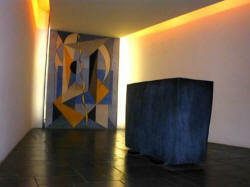 The halls of the United Nations has long been a haven for New Age one-world religion spirituality. Former Secretary-Generals like Dag Hammarskjold (founder of the U.N. Meditation Room), U Thant and former Assistant Secretary-General Robert Muller have long been outspoken advocates of a new pantheistic global spirituality, using the U.N. as a vehicle to spread their doctrine. The United Nations even has their own in-house prophet, Sri Chinmoy. This 70 year-old indian mystic is the official Spiritual Advisor to the United Nations. For the past 23 years he has offered prayer and meditation meetings for anyone to attend every Tuesday and Friday at the U.N. Sri Chinmoy claims to have been Thomas Jefferson in a previous life, and he also claims to be the spiritual brother to Jesus Christ. Chinmoy's disciples claim he's one of a handful of fully enlightened beings on the planet. Some disciples go so far as to claim he is an avatar, a living God. They meditate to a print of his face. Perhaps the final resting place for the "Ark of Hope" will be in the United Nation's Holy-of-Holies, the U.N. meditation room. "We have the UN Meditation Room, which is visited by hundreds of thousands of visitors a year," Robert Muller explains in his book Genesis: Shaping a Global Spirituality. "We have also a UN Meditation Group led by an Indian Mystic. One could tell several moving stories of the spiritual transformation the UN has caused, to the point that this little speck on earth is becoming a holy ground." "on divine and cosmic government" and an "alliance between all major religions and the U.N."
Muller has gone so far as to call the U.N. "the body of Christ." 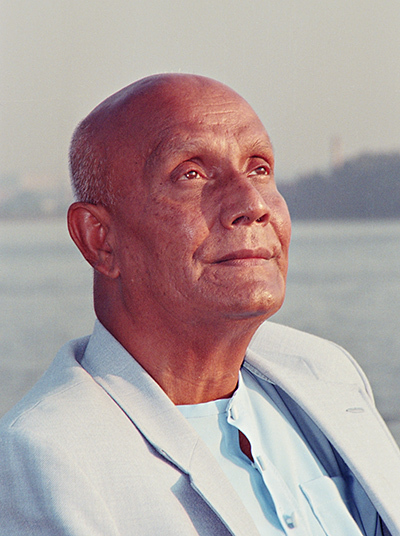 The United Nations "will be the last word in human perfection," Sri Chinmoy proclaims, it will "stand as the pinnacle of divine enlightenment." The Earth Charter stresses that man is his own savior. By saving "mother earth" we will once again return to an ideal Garden of Eden. But instead of worshipping the Creator, the New Age Aquarian conspirators wish to plunge us headlong into a creation-worship new world religion. "Little by little a planetary prayer book is thus being composed by an increasingly united humanity seeking its oneness," Robert Muller preaches. "Once again, but this time on a universal scale, humankind is seeking no less than its reunion with 'divine,' its transcendence into higher forms of life. Hindus call our earth Brahma, or God, for they rightly see no difference between our earth and the divine. This ancient simple truth is slowly dawning again upon humanity, as we are about to enter our cosmic age and become what we were always meant to be: the planet of God."